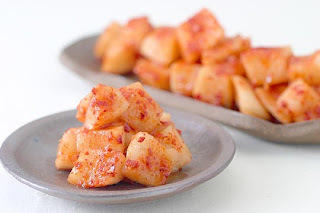 This is a modern day, quick version of kimchi that can be made without any special fermenting crocks or other equipment. The spiciness can be adjusted by reducing or increasing the amount of red pepper, or by changing the variety of pepper used. On the farm, the children make their own "kid's kimchi" without any pepper at all. (1) Peel the daikon and cut into 1/2 inch (or larger) cubes. Place in a plastic bag with salt, rub well, seal the bag, and set aside for several minutes. Drain the water and pat the daikon dry with a clean towel. (2) Put the daikon in a large bowl, add 1 tbsp of powdered red pepper, mix well, and set aside for 30 minutes. (3) Chop the carrot, apple, ginger, and garlic, and puree in a food processor. Put in a bowl, and add crushed red pepper, salted shrimp, long onion, and sugar. Mix well. (4) Combine the seasoning mix with the daikon. Add the konbu and mix well. (5) Place in a food grade plastic bag and seal, squeezing out any air in the bag. Keep in the refrigerator for 2 days. We like to add a dollop of sesame oil to the kimchi for extra flavor and a great aroma.